A few weeks ago, I had the chance to attend an event partially in promotion of The Everything Easy French Cookbook. The book is full of simple, classic French recipes, with a few twists here and there. At the event though, the author, Cécile Delarue pointed me in the direction of an effortless recipe for Fraises au Vin (strawberries in wine), mentioning how it was a favorite her grandmother would always prepare in the summer. My mind immediately went to the piles of strawberries Greg and I have been eating for the last couple of months. We slice them up, sprinkle a little sugar on top, and then spray on the canned whipped cream and dessert is ready. Sure, it’s simple and always tasty, but pretty uninspired—especially after multiple repetitions. So when I got the book home, I decided this would be the first recipe I’d try. Often it’s easy to overlook the shorter, simpler recipes like this in a new cookbook; however, the amazing thing about them is that they can awaken a whole slew of new ideas and riffs. 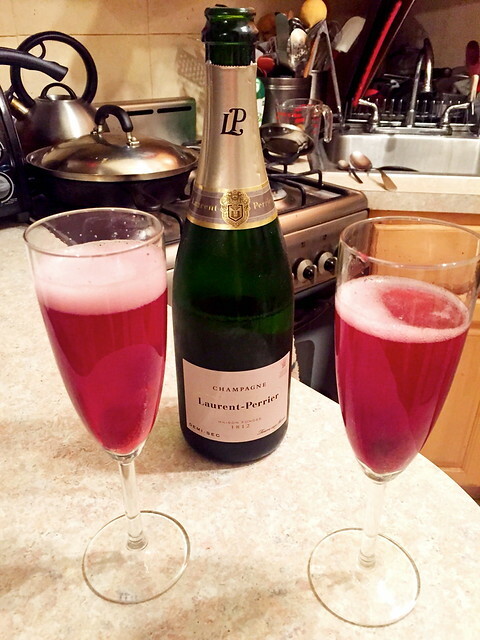 I’ve now made this recipe a couple of times, and sense that it is going to be a regular in our rotation. Bonus, it makes the kitchen smell incredible. Of course, we used them to dress up versions of our usual favorites. I served them on top of ice cream with a sprinkle of almonds. On another evening, I mixed them with diced up peaches and served them warm over pound cake with a dollop of whipped cream. 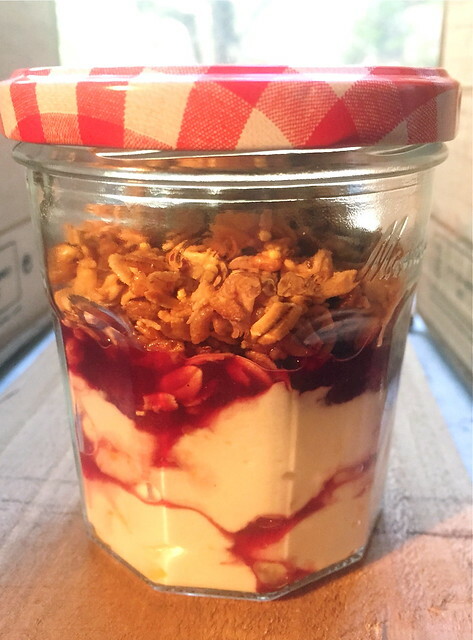 I also topped Greek yogurt with the strawberries and a little granola for a weekday parfait to go. 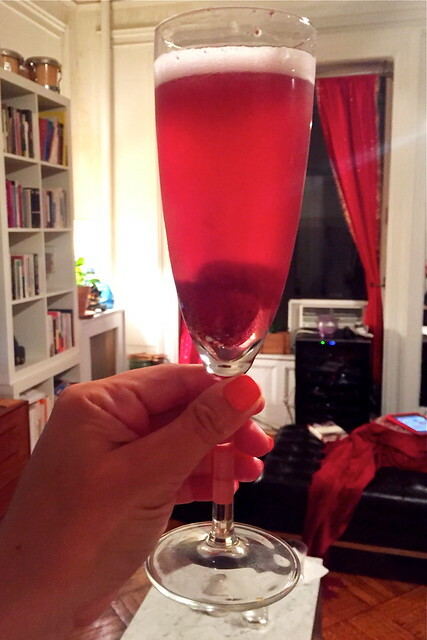 Or, how about adding the syrup and a strawberry to bubbles for a twist on your average Kir Royale? My favorite use, however, was probably as the topping for Stuffed French Toast pictured at the top. Scroll down for the recipe. I can see a million more possibilities for these strawberries – crepes, trifles, reduce down the liquid and use in pies, cocktails, and on and on. If it sparks your creativity, please share you creations. From The Everything Easy French Cookbook by Cecile Delarue. Copyright © 2015 by F+W Media, Inc. Reprinted with permission of the Publisher. All rights reserved. 1. In a medium saucepan, bring the wine to a boil over medium-high heat. Slice the top vanilla pod and add it to the wine with the cloves, star anise pods, and ginger. Add the sugar and stir with a wooden spoon. As soon as it begins to boil, reduce to low and simmer for 15 minutes. Pour in a large serving bowl and let it cool down to room temperature. 2. Take the vanilla pod out, scratch the seeds out with a teaspoon and put them back in the wine. Over a large bowl, cut the strawberries in half and sprinkle the lemon juice on them. Add them to the wine when it’s cold. Put in the refrigerator for 3 hours. 3. Serve cold in individual bowls, with the cooking liquid. 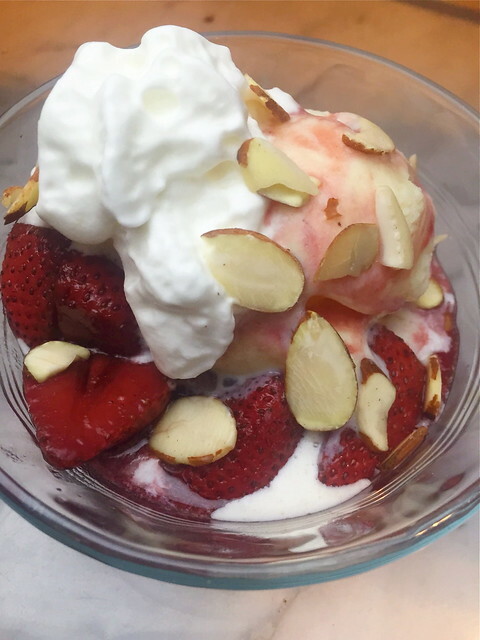 I like it this way, with strawberries served fresh and cold, however, I also really like them served warm and ever so lightly poached. To do this, I add the strawberries to the wine mixture just as soon as it comes off of the heat. 2. While bread is in the toaster, mix the cheese with the sugar, clove, cinnamon, and orange zest. Once the bread is toasted, spread divide the mixture and spread over 2 pieces of bread. Top each with one of the remaining slices to form sandwiches. 3. Beat the egg with the milk. Dip each sandwich in the mixture, making sure to coat both sides. 4. Heat a pan over medium-high heat and add a small amount of cooking oil. Place the sandwiches in the pan, and cook each side until golden brown. 5. 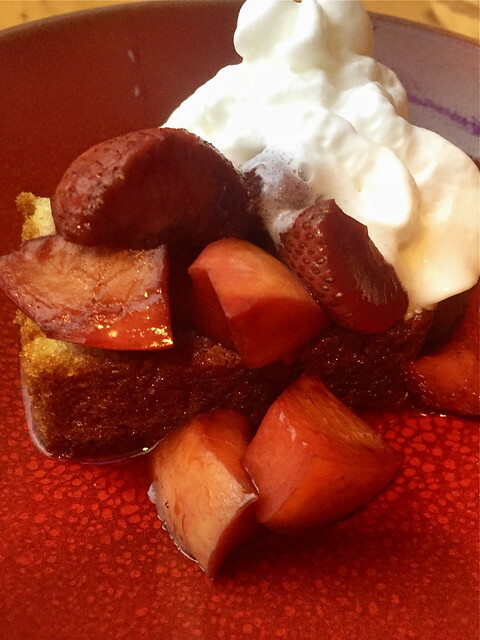 Serve immediately and top with the Fraises au Vin and sprinkle with powdered sugar if using.